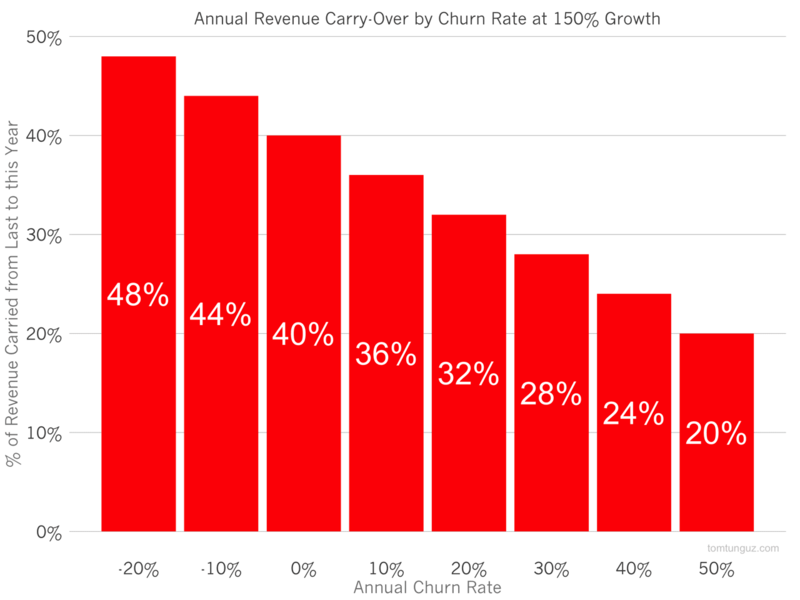 Every SaaS company should be focused on mitigating churn because greater retention enables a business to grow far more rapidly, to reduce the cost of customer acquisition, and to slash the amount of capital required for the business to grow. But there’s one additional reason to focus on churn: predictability. The more dollar churn a business creates, the less predictable its performance - and vice versa. Let’s paint the picture for a hypothetical startup which generated $2M in revenue last year and forecasts growing to $5M this year for 150% annual growth. The chart above plots the Carry Over Revenue for the company as a function of annual dollar churn rate. Carry Over Revenue is the fraction of this year’s revenue generated by renewing customers. If the business achieves 0% dollar churn, 40% of this year’s revenue is already locked in (the company will generate $5M this year and renewal customers will pay $2M of it.) If, on the other hand, the company churns 50% annually, about 20% of revenue/$1M can be predicted on January 1, about half of the previous case. And if the company generates negative churn, where the customer accounts increase in value over time, the carry over percentage grows to close to 50%. Of course, the faster a company grows, the smaller its Carry Over Revenue will be. For example, if the business were growing at 300%, at 0% churn the Carry-Over revenue would represent 25% of this year’s revenue. The goal isn’t to maximize Carry Over Revenue in the absolute. If a business achieves 100% COR, all of its business this year was last year’s business, then it won’t grow at all (unless the business has negative churn)! Rather, the aim should be to minimize churn to increase the business’ predictability. Predictable businesses are desirable businesses. If a startup can forecast to a greater accuracy how the business will perform, the startup’s management team can make better decisions about when to grow the team, increase marketing spend, raise capital among many other decisions. The company is one step closer to creating a money-making machine.